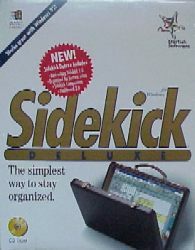 This document shows photos and brief descriptiosn of SideKick software's hsitory, along with notes and a brief list of features. While you may find older versions of software in many places, links to the old/used programming tools sales pages of EMS Professional Software, this page's sponsor, are provided for your convenience. EMS is not affiliated with Borland, Inprise, Starfish, or any other vendor. 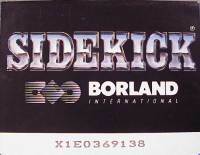 Sidekick and all other terms on this page are trademarks of Borland, Inprise, Starfish, or other companies. 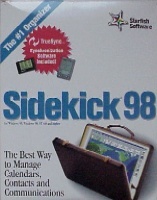 Includes Calculator, Notepad, Appointment Calendar, Auto Dialer, ASCII Table, and much more. Nine file-editor Notepads, up to 11,000 words each. Nine Outliners with automatic numbering, tree charts, and table of contents. Complete data and voice communications that you can set to take place in the background with auto-dialing, an encrypted glossary, and a full Script language. Even if you don't have a modem, it keeps your names, addresses, and phone numbers at your fingertips. 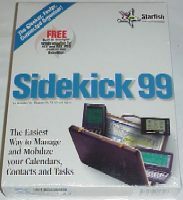 Includes a Calendar, Appointment Book, and Schedule window, plus alarms, repeating appointments, and attached agenda. Supports networks via a common calendar. 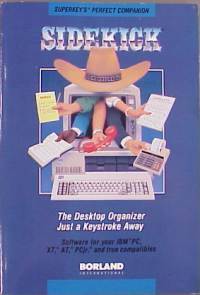 Extended DOS file and directory management. Four types of calculators: Business, Scientific, Programmer, and Formula. Clipboard for copy-and-paste integration between files and other applications programs. ASCII Table to find and paste characters quickly and easily. Expanded Memory and RAM disk support. If you have and Intel Above Board, you can load SideKick Plus desk accessories into expanded memory and leave your 640K of conventional memory for your other applications. Other cards supported: AST RAMpage!, Quadram Liberty, STB Memory Champion, and true compatibles. 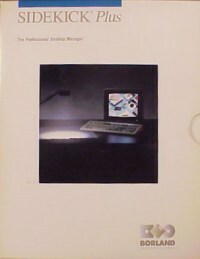 Mimimum System Requirements: PC-DOS/MS-DOS 2.0 or later, 384K RAM. Minimum RAM-resident memory for smallest configuration 64K. Hard disk drive. Modems for dialing and data communications: Hayes or Hayes-compatible, plus others. Networks: 3Com, IBM, Novell®, Vianet. 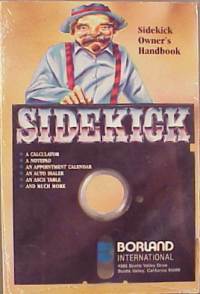 Includes cardboard slipcase and Owner's Handbook manual. 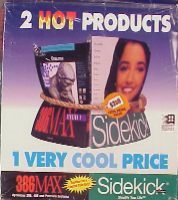 424 pages plus ads/index. 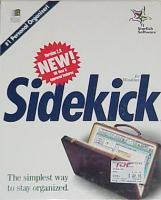 SIDEKICK Plus for SideKick Users manual. 30 pages. Rear cover part number BOR 0697. Quick Reference Guide. 23 pages. Three 720K 3.5" disks: Disk label rear BOR 0566A. Install 1 S/N "X1BO159412" or "T1B1234567" etc. 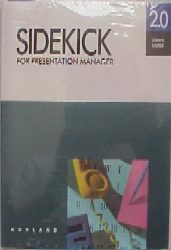 Sixth edition manual has "VERSION 1.5" printed on the bottom of the cover and on the spine. "PCjr" abbreviated "jr.". "Inforworld" typo in trademark block on book rear cover. ISBN 0-87524-002-X. June 1985. At least 9 printings. 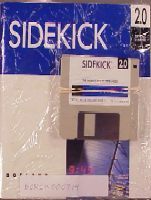 Version 1.56a has files dated 8-5-1985. 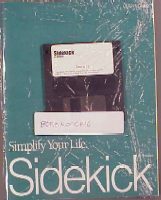 One 3.5" high-density diskette; Label reads "Sidekick for Windows, Version 1.0"
The deluxe version adds more than 40 content files for access to online information, Dashboard 3.0 for Windows, and the "Organized for Success" video. 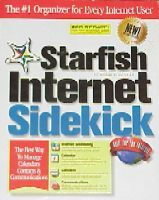 Requirements: MPC compatible CD-ROM drive, sound card, 256 color VGA or SVGA, Windows 3.1 or later, 486 or later compatible PC, 8+MB of RAM, and 10MB of free hard disk space. 9.00 and 9.10 versions exist. It appears 9.10 will be the last version ever made. 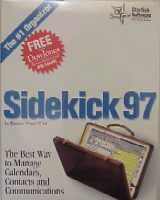 According to the PC World December 1999 issue, Sidekick 99 can no longer track expenses, dial a phone, log activities, or create reports. You get a well-designed but minimalist PIM consisting of a calendar, an address book, a world clock, and a memo pad. 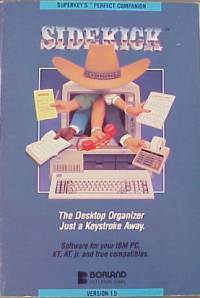 You still have the Cardfile, too--a wonderfully useful minidatabase where you can store just about any type of information you want. Among the few new additions: updated import filters and better synchronization with Palm Pilot and REX Personal Digital Assistants.